The Vegetarian sitting on top of my open poetry folder. My Book Bingo card is to the left. You can see that I have most squares crossed off already. This book did not count for Book Bingo. 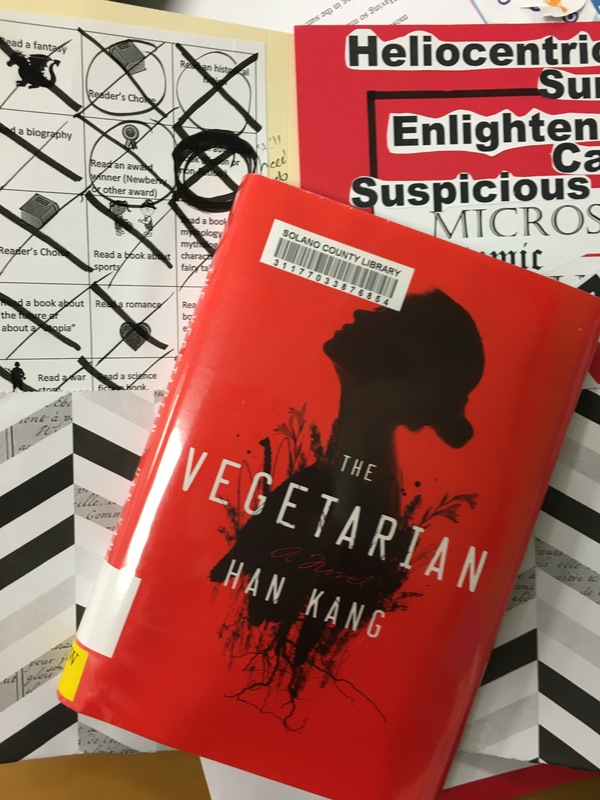 I was just four books away from having a blackout on my Book Bingo card when The Vegetarian arrived at my local public library. I loved it; I’m glad I read it; I’ll read it again; I didn’t understand it. Some of the reviews, maybe one quoted on the cover, have described The Vegetarian as Kafkaesque, specifically as homage to Franz Kafka’s The Metamorphosis which features Gregor Samsa who wakes one day to find he has been transformed into a giant insect. I agree with this coparison, but there’s something else going on in The Vegetarian; I’m just not sure what. Yeong-hye is the title character, a young, married woman who lives a quiet, ordinary life in modern Korea. (The novel was first published in Korea in 2007.) One night she begins having a recurring nightmare featuring a giant face that so disturbs her she is willing to do anything to make it go away, to make the dreams stop. So she becomes a vegetarian. This so upsets her family that they turn against her as though she has become something alien, an insect maybe. In a wonderful, very disturbing, dinner party scene when she reveals to her parents what she has become, they try to force her to eat meat, first by logical argument, then by emotional appeal and finally by force–her father holds her down, pries her mouth open and forces her to swallow a piece of meat which she immediately throws up. I’ve no idea how rare or how transgressive vegetarianism is in Korea, but I’m sure there is much more going on in this scene than what we see on the surface. There has to be. Just as things spiralled out of control for Gregor Samsa, they quickly do so for Yeong-hye. The novel is divided into three parts, the first narrated by her husband who leaves her after his own unsuccessful suicide attempt; the second by her brother-in-law a video/performance artist who uses her in a disturbing way, more disturbing than the video art in Claire Messud’s wonderful novel The Woman Upstairs; and the final section narrated by Yeong-hye’s sister. Though we never see Yeong-hye alone on the page, each of the three narrators tells us more about her until we suspect we might be able to understand her, but I don’t know. I think each of the three thinks they know her, but none of them really understands what she is going through. We find out that Yeong-hye’s father abused her, that she has long had mental health issues, that her vegetarianism is really the first step towards full blown anorexia that eventually threatens her life. 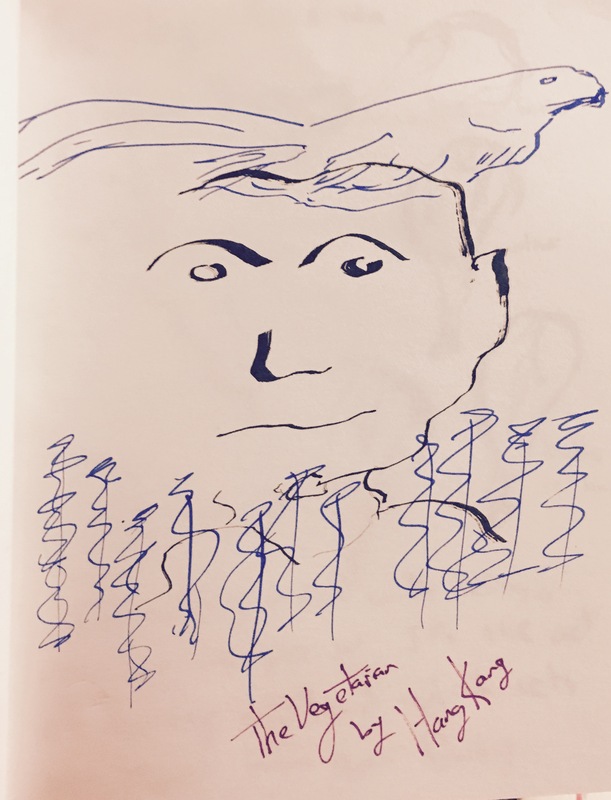 I thought Ms. Kang was going to show the reader a portrait of a woman as drawn by men, since the first two narrators were men, one a very sympathetic man who does not understand her the other a man who admires her but seeks to exploit her sexuality for his own art. I expected the third would be her father which would have made for a very interesting novel, a woman presents how three different men view the same woman. So the sister’s arrival threw me. Whatever Ms. Kang is up to, that was not it. Just what she is up to, I do not know. What I do know is that The Vegetarian brought a handful of very memorable characters into my reading and that Yeong-hye and her story have stayed with me for over a week now. I’m still trying to figure it all out. It’s a book I’d love to take a class on if only to be in a group of people like me anxious to hash out the text’s meaning in a circle of desks. Even if it doesn’t count for Book Bingo. If you’ve read The Vegetarian, I’d love to hear what you say, even if you think I’m totally wrong about it, especially if you think I’m totally wrong about it. And I’d be more than happy to do a read-a-long if someone wants to organize it. The Vegetarian really does warrant two reads. I”m not sure it does warrant two reads. In my April 13 review, though, I did wonder if it would be better if I had someone to talk to about it. I’m intrigued. Will try to get my sticky little paws on a copy. Great review – thanks. I have not read the Vegetarian. But I find the whole context of the story very fascinating. Well detailed review!